A new device for kids aims to bridge the divide between digital and physical, giving them both the flexibility of on-screen games and the tangibility of hands-on play. Osmo, as it's called, lets the iPad see what's in front of it, and that makes for some very interesting possibilities. The device itself is simple: just a special mirror that clips onto your iPad and lets the front-facing camera see the space immediately in front of it as it sits in a stand. 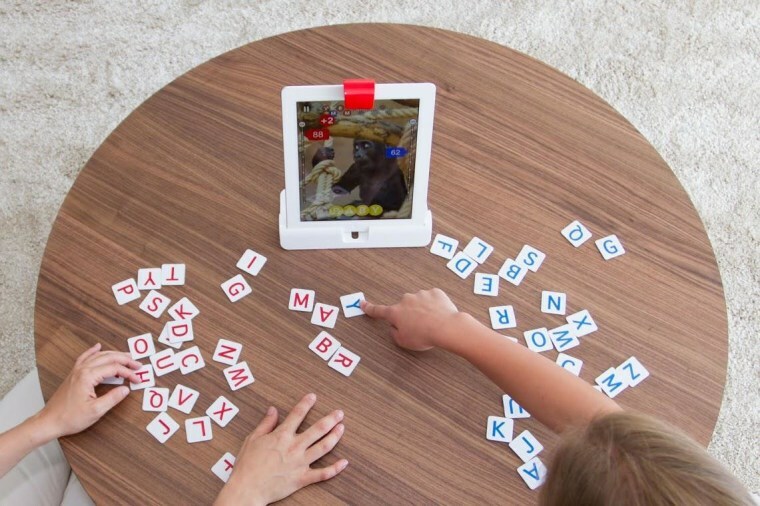 Using computer vision techniques, the Osmo software can then track and recognize letters, shapes and other objects as kids manipulate them. "When kids are glued to the screen, they're totally disconnected from the world around," Pramod Sharma, co-founder of Tangible Play, which makes Osmo, told NBC News. "Taking part with two hands is a fundamentally different experience." Osmo is launching with a set of games that demonstrate the idea in a few fun ways. One word game shows a picture, while kids compete in getting the letters that make it up into the play area. Another challenges kids to make shapes with Tangrams, tracking the pieces carefully and giving feedback as the player moves them around. The most interesting is probably the one called Newton. Tiny balls drop from the top of the screen and it's the player's job to get them some place or another. How? Draw slopes or buckets on a piece of paper and the game detects them as you adjust them in real time. Or use your hands, or a nearby spoon — the app makes sense of it and puts it in the game as a line drawing. The demo we saw worked well and looked like genuine fun — and testing with teachers and kids has been very promising, Pramod said. Kids play together, promoting social intelligence, and aren't limited to touching the screen. Tangible Play is doing a crowdfunding campaign to raise money for manufacturing, and of course there are the usual pre-order bonuses; Osmo will cost $99 when it comes out (probably at the end of summer) but tech-savvy parents might like to jump on the bandwagon early and save a few bucks.